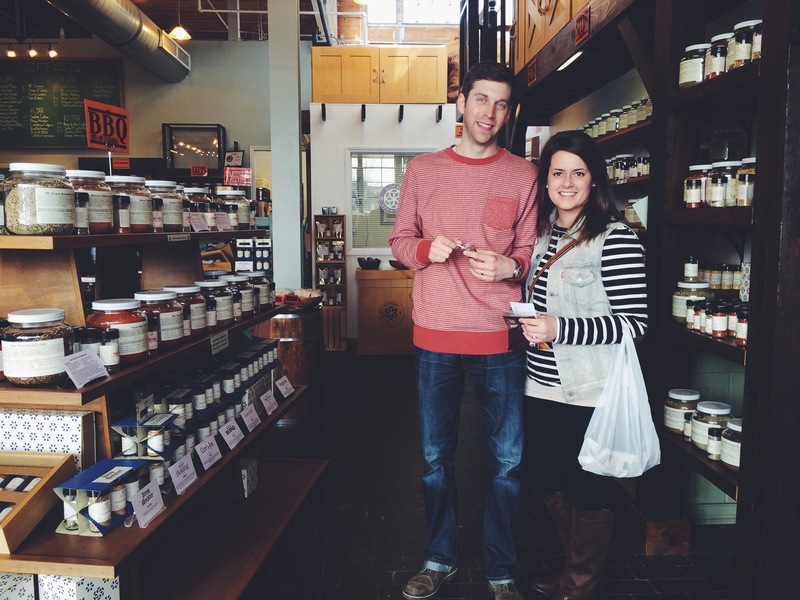 We started out at Atherton Mill then I brought them to Savory Spice Shop of course – we had an amazing time trying countless spices. My personal favorite part is when you dump the extra spices in your hand onto the floor – it goes against all the rules you’ve ever known, probably why it’s so fun! The weather was absolutely fantastic aka picnics in February. 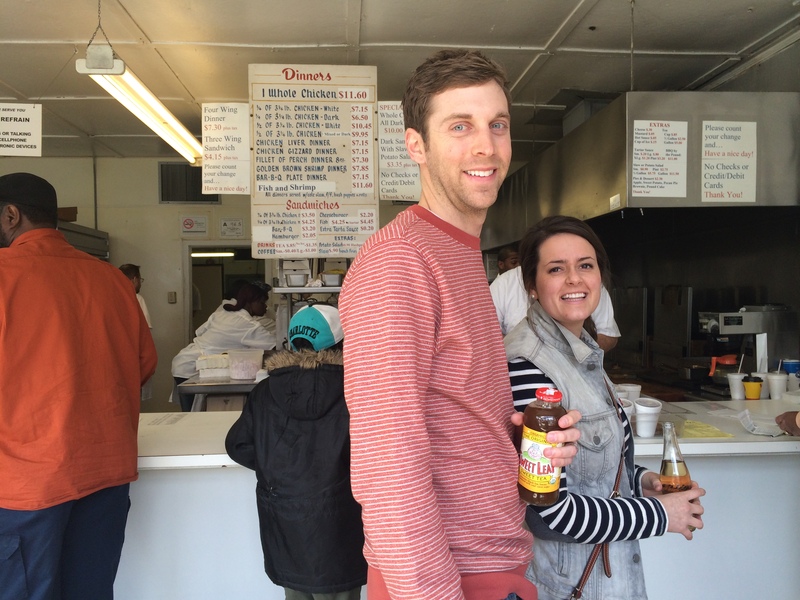 We had delicious fried chicken at Price’s Chicken Coop, a must if you stop in Charlotte. 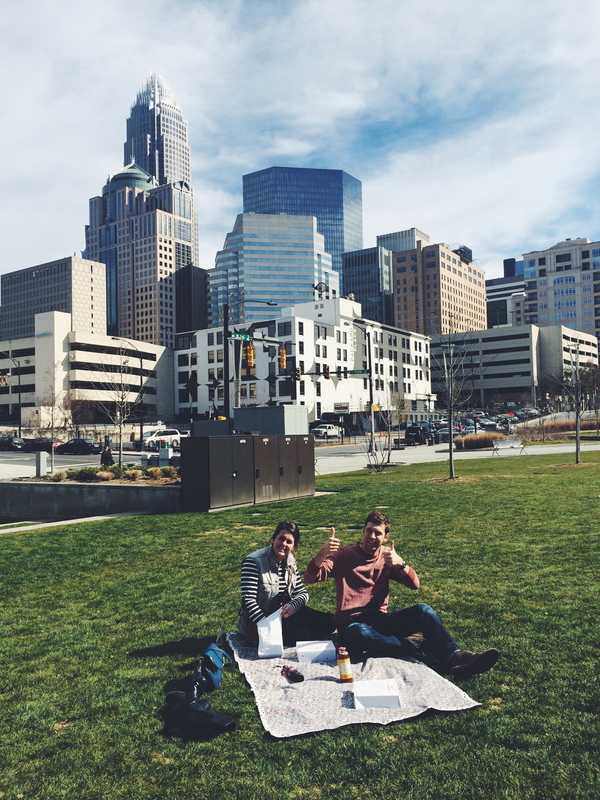 We ate in Romare Bearden Park, it’s relatively new to Uptown and it’s one of my favorites, how picture perfect are the two of them on that blanket? 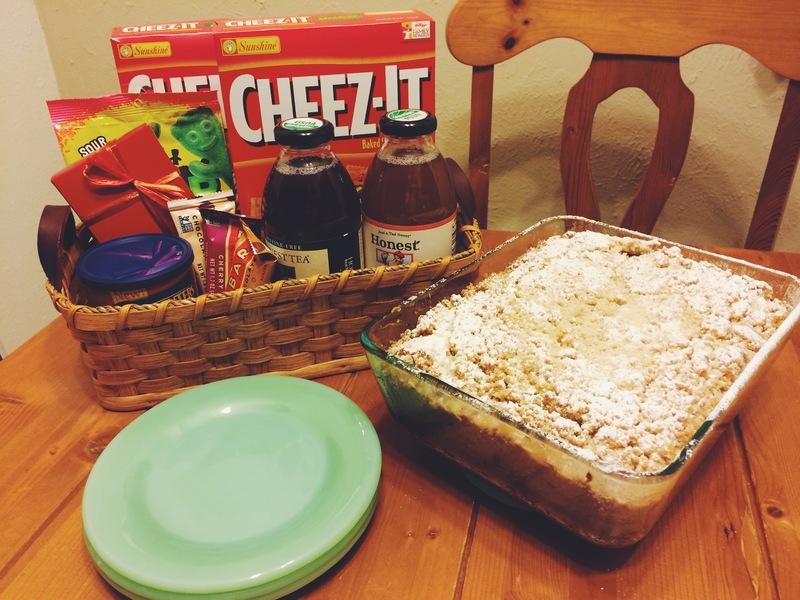 I made some coffee cake for our breakfast, you can find the recipe here. It’s funny how sometimes the Bible seems to be screaming new truths at you that you’ve never seen before. I swear it’s a new adventure every time you open it. My favorite part? How it beckons us to live a life of hospitality. So here are my thoughts. Hospitality today is cheap, expected and not authentic and it’s sad. It’s sad because Jesus has given us the most thoughtful story to mirror our lives after, yet we’re too caught up in the to-dos and half-tos to stop and see whom we might love, give to or invite in. I think that in those things true hospitality lies. Not in your porcelain platter or trendy family room. It has nothing to do with that. It’s not about entertaining, but it can absolutely involve it. Instead I think hospitality asks us to take on a giver’s heart, to humble ourselves so that we might serve the person in front of us. At the end of my days I want to be able to look back and see the quality of time well spent – but I don’t mean busyness, just quality. I want to have spent my days with my doors wide open, with my table set for strangers and my life a small piece in the Lord’s bigger picture. Daily I hope to become more like Jesus in each way and I especially want to be able to extend myself, to invite others in, just as He daily invites me to walk with Him and talk to Him. I want to love others how He loves me. We want flour & oil to extend the love that the Father extends to His children. So this weekend just reminded me of the most beautiful parts of life, I’m thankful for each day and the chance to have family members stay the weekend with me. It truly makes for the best of times. I agree completely regarding hospitality. It’s a joy to uncover someone’s needs and strive to meet those needs. Authentic hospitality requires that you invest in understanding your guest. It’s a rare and precious gift. Absolutely, I like that you called it a gift. Thanks for you thoughts.